What is the difference between Full Flavor and Mild Flavor of molasses? Is it produced differently? Contents differ? Is the mild a diluted form of the other? When to use which one in what kind of recipes? The examples shown here in this photo are both unsulphured. Q: What are there the different grades of Brer Rabbit molasses? 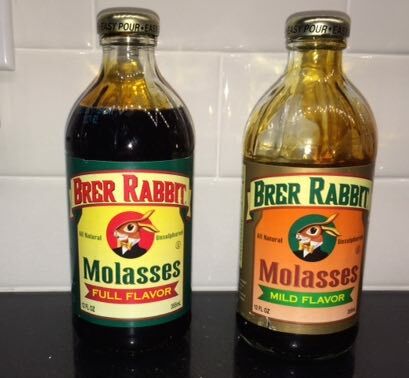 A: Brer Rabbit molasses comes in three grades: Mild Flavor, Full Flavor and Blackstrap. • Blackstrap: Bold, robust flavor used in slow-cooked dishes, like such as baked beans or barbeque sauces. Blackstrap is also an excellent source of Calcium and Magnesium and a good source of Potassium. I'd guess that the difference is the same thing, different words, as Crosby's "cooking" and "fancy" The fancy or mild is boiled down cane juice (without the sugar removed) and has more sugar and a more carmel-ish taste. The highest grade of molasses available, fancy molasses is the pure juice of the sugar cane, condensed, inverted and purified. It is 100% natural and contains no additives or preservatives. It is a bit lighter in colour than the other molasses products, and the flavour is tangy sweet. Blackstrap molasses is the highly-concentrated, final by-product of the refined sugar manufacturing process. As the sugar crystallizes, the residual cane juice thickens into a dark mass and is separated out through a centrifuge. The resulting molasses is very dark with a robust, somewhat bitter flavour. Like the fancy molasses, it is a pure product and contains no added sulphates or sulphites. Cooking molasses is a blend of blackstrap and fancy molasses. It is thicker and darker than fancy molasses — less sweet, with a more “full-flavoured” taste. Which wines have a strong, bitter flavor?